All of this feedback is publicly displayed. Spend five minutes reading the material next to Smith’s office door and you’ll know more about him than you know about some of the people you work with every day. 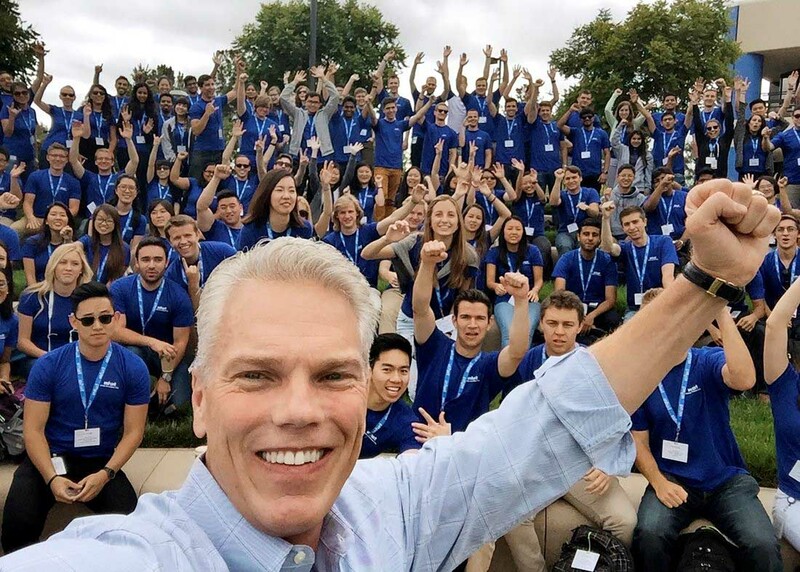 Of course most of Intuit’s 8,200 employees will never walk past Smith’s office—so he emails the whole package to all of them each year. Transparency is great, but this, you might think, is ridiculous. No one seems to think so at Intuit (INTU, +0.86%) , however, and that’s a clue to a mystery worth solving. It’s this: Why is Intuit still here? It’s No. 8 on Fortune’s new ranking of the Future 50, the companies best prepared to thrive and grow their revenue rapidly in coming years. Yet at age 34 it’s older than almost all the others. Its business, specialized personal-computing software, is brutally competitive. All its peers from 1983 (Flexidraw, VisiCalc) are long gone. 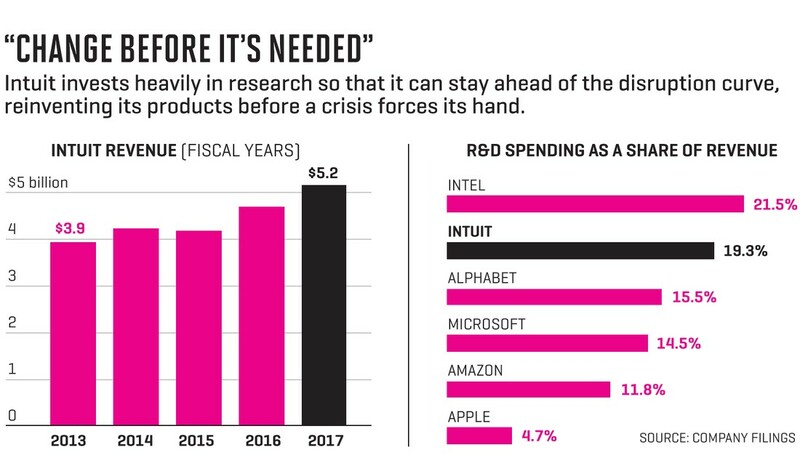 Yet Intuit is not just surviving, it’s blowing the doors off. Revenue, at $5.2 billion, is up 36% since 2012; profits are at an all-time high. Return on capital is a towering 60%, while cost of capital is a measly 6.9%, according to the EVA Dimensions consulting firm, which ranks Intuit’s financial performance in the 99th percentile of all public companies. Intuit is simultaneously more profitable than glamorous startups and growing faster than established incumbents. Even as its stock hits new highs, nearly all analysts rate it a buy. This is the Tom Brady of its industry—performing at the top of its game at an age when its onetime peers have long since stopped playing. Here’s part of the explanation: Since its founding, Intuit has done what every company today must learn to do, disrupting itself continuously, reinventing its products and its business model before any competitor can beat it to it. The company’s original product, Quicken personal-finance software, had to be re-?created when Microsoft Windows supplanted the DOS operating system. New products in the 1990s, QuickBooks for small-business accounting and TurboTax for personal tax preparation, defeated incumbents—and maintained their leads when Intuit re ?created them online for the web’s earliest days. Those products had to be reconceived again at the dawn of the mobile era. It all seems obvious in retrospect, but each transformation was a mind bender at the time—doing taxes on a phone?—which Intuit achieved, avoiding the creeping danger of big-company disease. The company gambled that it would become stronger, not weaker, by welcoming outside developers—potential competitors —onto an online platform where they can offer apps that work with Intuit products. Example: American Express offers a free app for holders of AmEx business credit cards that automatically transfers card transactions to the user’s QuickBooks Online account every day. It’s a selling point for American Express, and it ties QuickBooks customers more strongly to the platform by making their lives easier. The open platform is working and now offers some 1,400 apps. 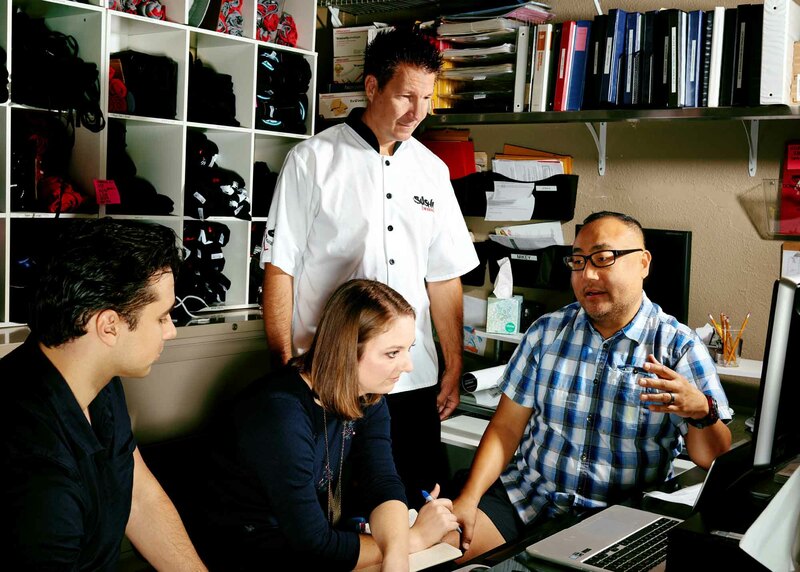 It has also created unexpected opportunities for Intuit. For example, a major factor in the success or failure of a small business is whether it works with an accountant. Intuit has relationships with 600,000 accountants who use its tax software. So last year Intuit launched an online matchmaking feature to connect accountants with QuickBooks Online users. In the past year an estimated 600,000 small-business customers have become new clients of accountants, thanks in large part to this feature. “That’s a huge win-win for both of them,” says Smith, “and for us it increases the retention of QuickBooks by 16 [percentage] points.” Which is saying something, because the pre-matchmaking customer renewal rate for QuickBooks Online was around 75%. Intuit thus is becoming an ecosystem in which several parties—customers, app developers, accountants, and Intuit—find new ways to interact for mutual benefit. Another reinvention. The recurring pattern is that Intuit disrupts itself without the motivation of a crisis. That’s highly unusual. Thousands of companies across the economy—retailers, carmakers, media firms, financial advisers—are trying desperately to remake themselves for a digital world lest they become the next Toys “R” Us or ?Kodak or San Francisco Yellow Cab: bankrupt, diminished, maybe dead. Few of those efforts will end well. Virtually all companies that get disrupted have a digital strategy; it’s usually inadequate, or they can’t execute it. Even survivors of a crisis almost always end up smaller, less significant in their industry, and employing fewer people. By contrast, Intuit preempts crises, compiling a record of prescient, low-drama transformation in a high-drama age, and thriving as a result. The result was QuickBooks, which passed the market leader (called DacEasy) in just two months, even though QuickBooks cost twice as much ($99 vs. $49) and had fewer than half the features. “But we had solved the biggest unsolved problem,” Cook says. Today QuickBooks brings in half of Intuit’s revenue. The key, which Intuit has never forgotten, was to focus on the finding that makes no sense. Most organizations do the opposite, as Cook and his colleagues did at first. They ignore the information that doesn’t fit, or convince themselves it isn’t important. Time and again, digging into the puzzling discovery —“savoring the surprise,” as Intuit’s leaders call it—has enabled the company to reinvent itself before competitors caught on. For example, Intuit recently found that some users of its online money management service Mint weren’t behaving like the young-professional target market. Investigating that surprise showed that these customers used Mint to manage self-employment income and spending; many were Uber or Lyft drivers, for example. With the gig economy growing, Intuit recognized a huge opportunity. So it created a version of QuickBooks especially for the self-employed. It’s the company’s fastest-growing product. The underlying reality is that you can’t believe what customers tell you, as most companies learn the hard way. Customer behavior is the truth. Tiny teams. New ideas are initially developed by “discovery teams,” typically only three people. They don’t report up the chain of command but instead go straight to a division general manager. The teams get intensive coaching every week or two from the GM or Cook, which helps them stand up to the barrage of opposition they’ll inevitably face from those with a stake in the status quo. The new self-employed version of QuickBooks was developed by a discovery team. Shared experiences. When new ideas get further along, shared experiences can often obliterate conflicts. Six or seven years ago, when Smith wanted Intuit to focus on mobile devices, stiff pushback came from managers who believed the then-conventional view that no one makes money on mobile. So Intuit found companies that were making plenty of money on mobile and assigned managers to interview their executives. Next step was an off-site where they would report what they learned. “We didn’t have enough time,” Cook says. “They wouldn’t stop. They were convincing each other there was money to be made in mobile.” Today, using TurboTax, you can prepare and file a full 1040 from your phone. Any company could adopt those managerial techniques tomorrow, at least in theory. Far more difficult to adopt, and perhaps more important to Intuit’s self-disruptive success, is a culture that facilitates reinvention. A key element is permission to admit mistakes, shortcomings, and failures, which is valuable in two ways. First, when an organization tries to change, it is implicitly admitting something isn’t working. No organization wants to admit that. People get punished when something isn’t working, right? And if no one will go there, change is forever blocked. Change gets unblocked when top managers routinely admit their mistakes. In 2009, when Smith had been CEO for a year, he presided over a dinner for about 100 people in engineering and product design, including some from other companies. “Brad gave a talk and said, ‘Here are the things I screwed up on,’?” Cook recalls. “It was hard to imagine any other CEO giving that talk.” In 2015 the company raised prices on its desktop TurboTax products, and customers revolted. The business’s leader, Sasan Goodarzi, said, “?‘I own this decision. I had no idea this would happen, and I’m sorry to you all. Here’s why we did it,’?” reports a witness. “It made a big impact.” Goodarzi is still at Intuit and widely considered a rising star. Every company says it wants to learn from mistakes, not punish them, but few companies live that way. The second advantage of an open, fess up culture is subtly different. Remember those performance reviews and feedback reports taped up outside Smith’s office? They’re Smith’s proclamations that he himself must change. When top leaders admit that they must fix their flaws, it’s hard for others to claim that they or their business unit are beyond improvement. The temptation to leave things alone is powerful right now, with Intuit performing so well. Yet the company faces sobering risks. The most obvious is a data breach. If you use TurboTax and QuickBooks, Intuit knows your Social Security number, your bank account numbers, your credit card numbers, everything about your brokerage accounts, and your children’s names, among other things. Consumers rank Intuit No. 8 among all companies for privacy trustworthiness in the latest survey by the Ponemon Institute research firm, just behind HP and ahead of PayPal. That’s a titanium-strength competitive advantage, but it could vaporize after a major break-in. Though Intuit utterly dominates its fields, competitors aren’t giving up. Its most credible competitor is Xero, a New Zealand–based small-business accounting startup. It’s a minor factor in the U.S. and Canada, where Intuit rules; trouble is, Intuit is a minor factor in the rest of the world. Intuit is belatedly going global, and because its software is available as a service in the cloud, it has at least a few customers in 180 countries. But most of the planet remains wide open to competitors, and Intuit’s brands aren’t nearly as strong abroad as they are in North America. There’s even a danger, probably small, that the IRS might become a competitor. Intuit is one of several software companies that in 2003 agreed with the IRS to provide free tax prep and filing for low-income taxpayers; in return, the IRS promised not to offer tax software. That agreement expires in October 2020. The very thought of IRS software probably makes most taxpayers’ blood run cold, but since the prospect of crossing the IRS is even scarier, millions might opt to use such a product. A version of this article appears in the Nov. 1, 2017 issue of Fortune.